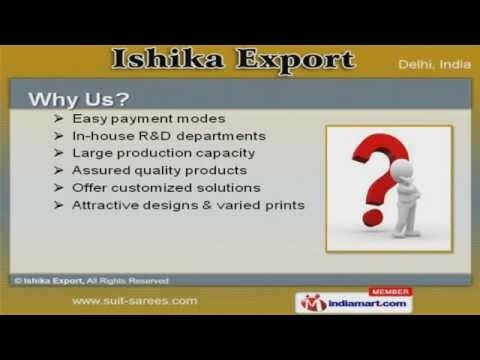 Welcome to Ishika ExportManufacturer & Exporter of Designer Sarees & Lehengas he Company was established in the year 2010. We have spread our wings to Europe,America & Australia. Easy payment modes, large production capacity & customized solutions make us thefirst choice of our clients. We offer a wide assortment of Designer Lehenga, Party Wear & Embroidery Sarees. Our Bridal Sarees & Chiffon Designer Suit are available in excellent designs & uniquepatterns. Georgette & Viscose Designer Suit offered by us are widely acclaimed in the market. Our Brasso Designer & Embroidery Suit are best in the industry amongst others. We also provide Indian Designer & Casual Wear Suit that are a class apart. Along with that we offer Designer Net Sarees & Lehnga that are cost effective.